Our Belties spend the winter outside in my sacrifice pasture, with access to run in shelters and close enough to the barn to fill the heated trough. Through the winter I move the location of the round bale feeder to spread out the waste hay and manure. Later in the season this well fenced pasture will be where the lambs learn about electric pulses, where rambunctious animals are pastured when I am away from the farm and where the bull will visit Blair. 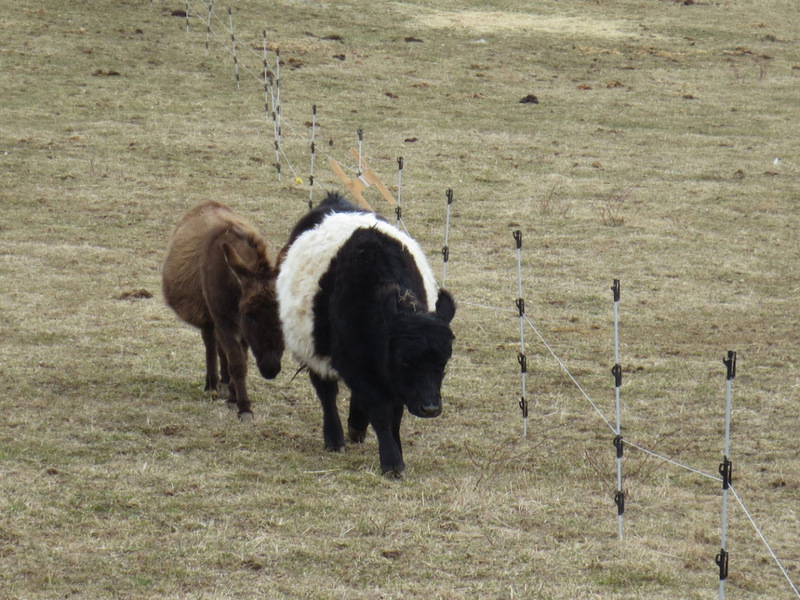 In an effort to limit the damage casued by heavy hooves and insatiable mouths on spring pasture I set temporary posts in the ground last fall. With warmer temperatures predicted I unrolled the electric twine today closing off the lower section of the barn pasture. Once hay feeding is done and the water fowl pens are moved I will spread out the remaining hay litter and see what comes up.